Playing in the Scottish Premiership is good preparation for facing Salzburg in the Europa League, according to Celtic manager Ronny Deila. The Austrians top Group D, two points ahead of their Scottish hosts. "They are very aggressive, intense with their pressure and direct in their play," said Deila. "We have to cope with that, but we are quite used to that in the Scottish league - it is also a direct league with intensity." "It is a game that will suit us and we saw that, when we played them away, we can handle it." Salzburg are unbeaten in their last eight away ties in the Europa League and have already qualified for the knock-out stage. 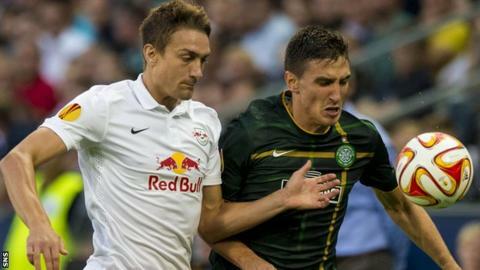 But Celtic came away from the Red Bull Arena with a point after a 2-2 draw in Austria in September and the Scots can take over at the top of the group and qualify themselves should they win on Thursday. "There have been a lot of big games this season, but this is important because, if we win, we go top of the group and go through," said Deila. "It is a good game as well. We are going to meet a very good opponent and we will be tested at the highest level. "They are very different from a lot of the other teams we have met. Deila says his players are itching to face the Austrians even though they could qualify by default should third-placed Dinamo Zagreb fail to beat Romanian outfit Astra. "If we win the game, we are in the position we want to be, so we are really up for the game," he suggested. "There was a lot of energy in the training today, so I am looking forward to it." Deila believes Salzburg are a match for any team they have played in Europe this season, including Legia Warsaw, who knocked Celtic out of the Champions League qualifiers before the Scots were reinstated due to an administration error made by the Polish club. "I think they are the best," said the Celtic coach. "Maybe Legia Warsaw, it is very hard to say, we have met good opponents in Europe, but Salzburg have had some good results and been at a high level for a couple of years."